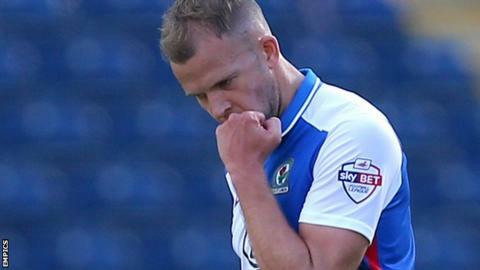 Jordan Rhodes scored a goal in each half as Blackburn beat Charlton to register their first win of the season. Rhodes turned in Grant Hanley's header from a Craig Conway corner just before half-time to put the hosts ahead. Substitute Tom Lawrence crossed from the right to set up Scotland international striker Rhodes for his fourth goal in three games. And Lawrence finished an excellent team move with a powerful shot into the roof of the net for Blackburn's late third. Charlton actually had the first clear chance of the game but Tony Watt's lob was not on target. Addicks 'keeper Nick Pope had twice denied Rhodes, before the striker gave Rovers the lead with a close-range header following Hanley's flick on. Although behind, Johann Berg Gudmundsson and Watt both went close to equalising before Rhodes turned home at the near post to extend Rovers' lead. Wales international Lawrence scored 10 minutes after coming on as Blackburn moved out of the relegation places with their first three points of the season. Blackburn manager Gary Bowyer: "We know if we create the chances, we've got the best finisher in the league (Rhodes). "They were terrific after a tough week, two trips to London and back, all the travelling. They were outstanding today, but that's what we were - ruthless in both boxes. "There's a good feeling in the dressing room but it's just the start, we won't get carried away and hopefully now we can kick on because the level of performances has been sky high." Charlton manager Guy Luzon: "I thought that our attitude today was good. We started the game well, organised in defence and in attack we created some good occasions in the first half. "In this division it's very important to score the first goal and, unfortunately, Blackburn scored in the last minute of the half." Jordan Rhodes (far left) scored his third consecutive league brace against the Addicks. Match ends, Blackburn Rovers 3, Charlton Athletic 0. Second Half ends, Blackburn Rovers 3, Charlton Athletic 0. Attempt saved. Johann Berg Gudmundsson (Charlton Athletic) left footed shot from the left side of the box is saved in the centre of the goal. Assisted by Ahmed Kashi. Corner, Blackburn Rovers. Conceded by Conor McAleny. Substitution, Blackburn Rovers. Lee Williamson replaces Corry Evans. Goal! Blackburn Rovers 3, Charlton Athletic 0. Tom Lawrence (Blackburn Rovers) right footed shot from the centre of the box to the top right corner. Assisted by Adam Henley. Attempt saved. Ben Marshall (Blackburn Rovers) right footed shot from the centre of the box is saved in the centre of the goal. Assisted by Craig Conway. Corner, Charlton Athletic. Conceded by Adam Henley. Attempt blocked. Conor McAleny (Charlton Athletic) right footed shot from the left side of the box is blocked. Assisted by Tony Watt. Attempt blocked. Johann Berg Gudmundsson (Charlton Athletic) left footed shot from outside the box is blocked. Assisted by Igor Vetokele. Goal! Blackburn Rovers 2, Charlton Athletic 0. Jordan Rhodes (Blackburn Rovers) right footed shot from the right side of the six yard box to the bottom right corner. Assisted by Tom Lawrence with a cross. Substitution, Blackburn Rovers. Tom Lawrence replaces Bangaly-Fodé Koita. Corner, Charlton Athletic. Conceded by Shane Duffy. Substitution, Charlton Athletic. Conor McAleny replaces Zakarya Bergdich. Tony Watt (Charlton Athletic) wins a free kick in the attacking half. Corner, Blackburn Rovers. Conceded by Patrick Bauer. Attempt missed. Tony Watt (Charlton Athletic) right footed shot from the centre of the box misses to the right. Assisted by Johann Berg Gudmundsson. Offside, Blackburn Rovers. Jordan Rhodes tries a through ball, but Bangaly-Fodé Koita is caught offside. Substitution, Charlton Athletic. Igor Vetokele replaces Mikhail Kennedy. Attempt missed. Craig Conway (Blackburn Rovers) right footed shot from a difficult angle and long range on the left is high and wide to the right. Assisted by Jordan Rhodes. Bangaly-Fodé Koita (Blackburn Rovers) wins a free kick in the attacking half. Offside, Charlton Athletic. Morgan Fox tries a through ball, but Tony Watt is caught offside.